Investing in individual marijuana stocks is a risky game since most of them are the scam. One needs to understand complex picture behind this to choose the right stocks. We, in trendviatrend.com, believe that selection of pot stocks ideas published here are not crap and will perform well in future. However, if you don’t trust this analysis and still want to invest in young and quickly growing marijuana industry you can safely invest in particular exchange-traded funds (ETFs). The best one is Horizons Medical Marijuana Life Sciences ETF. Interesting times are happening on the chart of HMMJ.TO from technical perspective. Before we jump to the technical analysis, let’s realize what is actually happening in this exciting industry. We could go into details and name other important facts that support a growth within the industry. 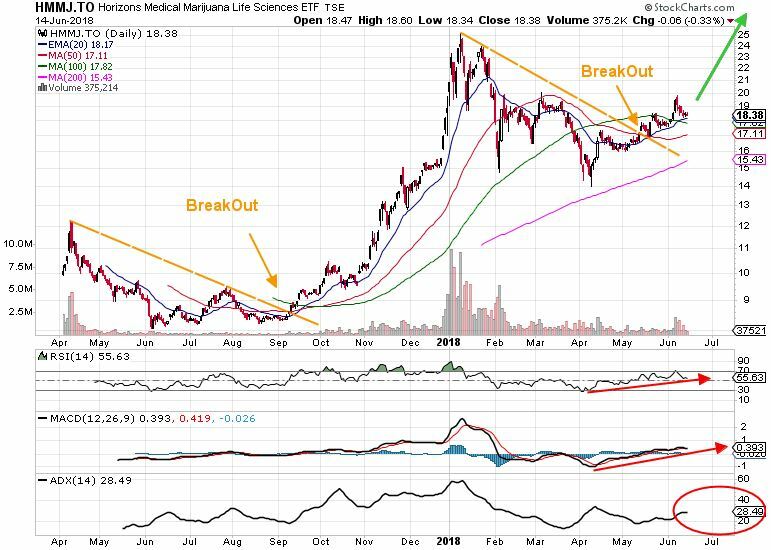 Horizons Medical Marijuana Life Sciences ETF has exposure mostly in Canadian and US companies engaged in this business. I like Mark Twain’s assertion “History does not repeat – History rhymes!”, because if spotted well, it so much applies to a stock market that even the most experienced ones would agree. The ETF was created and started to trade on a stock exchange over a year ago. As most of the new listings, it took a downward mode until the trend was broken in September. A cross of 20 EMA through 100 SMA supported the breakout and price surged up constantly bouncing from 20 EMA. As a new year arrived, the dope stocks peaked and consolidation was very needed. This consolidation was ended recently when many good marijuana companies have swung up. RSI, MACD or ADX are also showing the strong trend. It is a wonderful time to invest in Horizons Medical Marijuana Life Sciences ETF. Whether you’re a long-term investor or you want to play the swings, this investment gives an opportunity to profit from its value increase in future. The most important is to stay disciplined and focused on big picture.